Out of the deepest hurts of the human condition, Randy Alcorn brings into clear focus our most pressing questions about evil and suffering—including those that wrench our souls when we or someone we love is victimized by evil or assaulted by disease. He faces these questions with seasoned sensitivity, skillful insight, and a heart of compassion. He dodges none of the difficulties, and never lapses into platitudes, hand-wringing, or oversimplification. Boeken die vergelijkbaar zijn met If God Is Good: Why Do We Hurt? 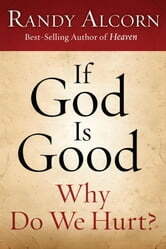 Good book has some great references and reasonings.